The Best Superfood Product Ever Just Got Better Quite simply, LifeSource SuperSprouts is the most nutritious, best tasting superfood product available anywhere. It is packed solid with nutrient dense ingredients and life enhancing phytochemicals. LifeSource SuperSprouts were created with one thought in mind: gathering the purest, nutrient-dense foods on the planet that have phytochemicals that, according to research, help the body age better. * They have everything the body needs to enjoy optimal health. 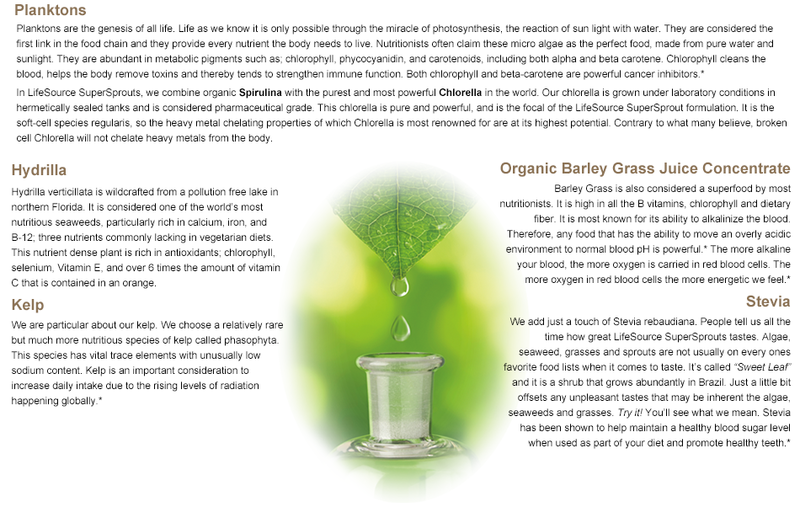 * LifeSource SuperSprouts combine the most powerful superfoods with organic sprouts. These super sprouts provide the life force energy that gives birth to the entire plant kingdom, s seed providing the spark that bursts new life to a new plant. Through LifeSource SuperSprouts, we combine organic Spirulina with the purest and most powerful Chlorella in the world. Our Chlorella is grown under laboratory conditions in hermetically sealed tanks and is considered pharmaceutical grade. This Chlorella is pure and powerful and is the focal point of the LifeSource SuperSprouts formulation. Golden flaxseed is one of the most nutritious seeds on the planet. It is loaded with essential fatty acids, but most people don’t know that flaxseed also has a high concentration of enzyme inhibitors, making it difficult for the body to absorb. Sprouted flaxseed allows your body to absorb all the vital nutrients, enzymes, amino acids, and vitamins. In fact, the process of germination fundamentally changes the nutrient composition of the seed. Vegetarians and other non-fish eaters are typically deficient in eicosapentaenoic acid (EPA) and docosahexaenoic acid (DHA). The broccoli sprout is one of the most researched natural ingredients for its powerful properties. Broccoli sprouts contain a phytochemical called glucoraphanin and an enzyme called myrosinase, both of which are precursors to sulforaphane. 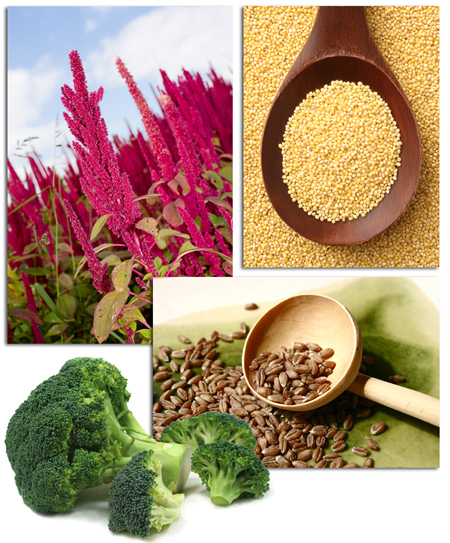 Quinoa is 18% protein and has the most balanced amino acid profile of all grains. Most grains lack lysine and, therefore, cannot biosynthesize into a complete protein. Quinoa is an excellent source of dietary fiber and is high in phosphorus, magnesium, and iron. Quinoa’s high magnesium content perfectly balances the high calcium in chia seeds. Chia seeds contain powerful phenolic antioxidant properties. Kirlian photography can capture the subtle energy fields that emanate from any substance. You can use it to determine the amount and integrity of life force energy of any physical matter. This is usually referred to as an aura in human bodies. The Kirlian pictures on the left compare the life force energy of LifeSource SuperSprouts to another popular, similar product. You can see that the life force coming from LifeSource Super Sprouts is considerably more powerful than the other leading products. In fact, LifeSource SuperSprouts has been found to have more than 30% greater life force energy than any other product of its kind.